Most probably, your dentist often advises you to floss regularly. It’s likely you’re already aware of the numerous benefits daily flossing provides. Unfortunately, it becomes a struggle for many people to make it a habit. And there are always those who say that it’s time-consuming and that it makes their gum bleed. Others claim that it fits too tightly around their fingers, thus hurting them. Well, if you’re the kind that dislikes traditional flossing methods, water flossing is your ultimate alternative. Corded water flossers often come with large water reservoirs. So they hold enough water for multiple flossing sessions. However, this kind of flosser requires that you plug it into a source of power to use it. 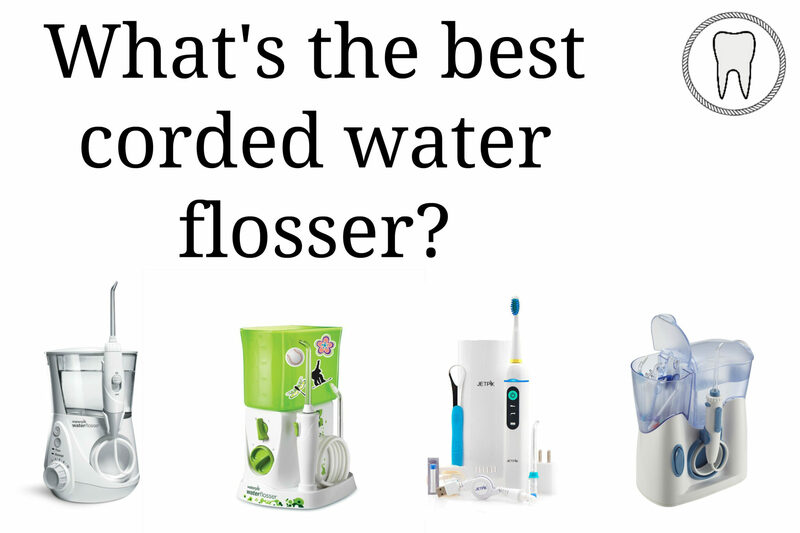 Below, we review the five best corded water flossers to help you make an excellent selection from the myriad of models available on the market. These reviews are entirely accurate, honest, and unbiased. 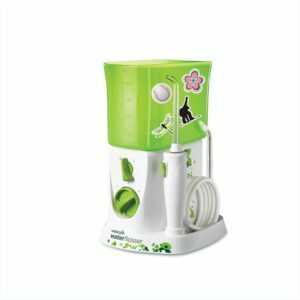 This model is widely known as the best water flosser for kids that are six years and older. The WP-260 will clean around orthodontics and remove much more plague than regular flossing methods. Thus giving your child(s) the healthiest gums ever in just 14 days. It’s fully customizable to make it fun and comfortable for your children to use, thanks to the incorporation of 3 different pressure settings. The compact and colorful design will spark your child’s interest. With 20 removable fun decals, it features an electric-proof design which will shield your kids from electrocution. 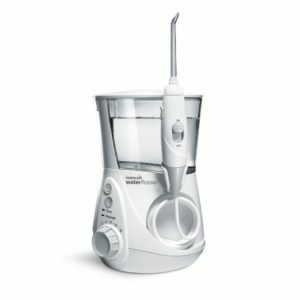 Here’s another impressive water flosser which comes with a fantastic sonic electric toothbrush. It’s a 2-in-1 model that incorporates both flossing and brushing features to guarantee you the healthiest gums in just 14 days. It has undergone numerous clinical studies which have proven its uniqueness in brushing and flossing your teeth when compared to other flossers out there. The water pressure and pulsating effect are brought together to allow for a powerful force which mercilessly removes all harmful bacteria present in your mouth. 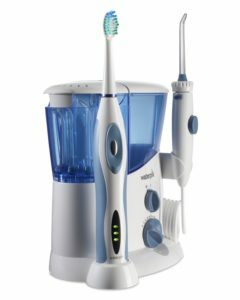 And it offers ten different pressure settings, two-speed modes, and five different tips to give you a superb flossing and brushing experience. It’s a top-rated model that’s quite worth the price, offering you plenty of incredible features. This water flossing option has been receiving loads of praise and positive feedback due to its efficiency in flushing out all debris and food particles from the mouth. You can adjust between different ten pressure intervals using an easy-dial button. Coming with a 2.2-ounce reservoir, it can hold water for up to 90 seconds for one flossing period. An inbuilt pacer will alert you when you need to switch to the next quadrant of your mouth. And it has two different pulsating modes, namely the Hydro-Pulse and Floss. 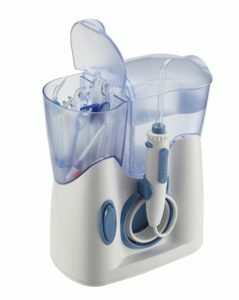 This model is among the best water flossers as it offers multiple superb features and loads of benefits. It certainly deserves prior consideration. This countertop model boasts an incredibly quiet design and is 100% waterproof. It won’t wake the family up even if you floss at midnight. It features six different speed settings and up to twelve rotating interchangeable tips. You can adjust the water pressure up to 110 psi. It combines water pulsations and pressure to clean below the gumline and deep in between the teeth. The H2OFloss HF-8Whisper has a large, independent water reservoir. And you can use it for orthodontics, periodontal, nasal irrigation, as well as tongue cleaning. The Profloss 4190 is a no-frills faucet-powered water flosser of a simple design. Constructed of plastic, it comes in white and blue accents. It features a straight cylindrical body without any taper or angled tip. It’s slim enough to be used by kids and adults alike. It’s 8 inches tall and weighs a light 4.8 ounces. The absence of a battery and a pressure generating motor allows for its thin, lightweight nature. This model comes with a zipper bag, storage pouch, coiled hose, and an aerator which will connect to your bathroom’s faucet. A simple dial enables you to choose between the four different pressure settings. 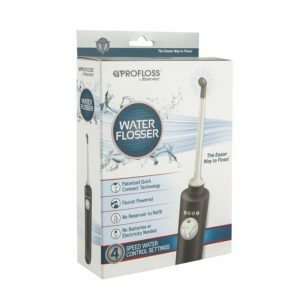 The ProFloss 4190 is a simple, inexpensive, and portable water flosser, featuring all essentials, and without any bulk noise or electrical requirements. Water flossing will improve your quality of life. It’s superior to regular floss in several excellent ways. It’s imperative that you only select the best water flosser that guarantees to reduce gingivitis, gingival bleeding, and to eliminate plague effectively. Your dental situation doesn’t matter. You can find a model perfect for sensitive gums, braces, or those stubborn food chunks that are lodged between your teeth.